The graph above should be all I need to explain how Delisted Games fared in 2017! 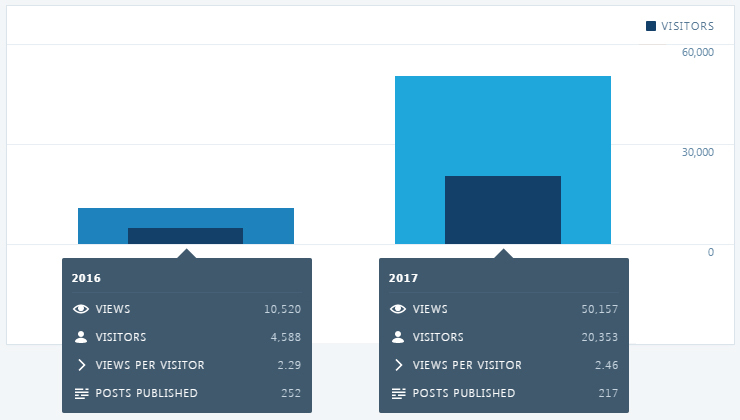 Thank you all for nearly quintupling the number of visits and page views to the site in our first full year online. I know it’s a bummer to end up coming to the site but I’m very happy to have been able to provide advance notice of upcoming delistings or confirm your sneaking suspicions that a game is gone. Once again, Scott Pilgrim vs. The World: The Game was the undisputed most viewed title on the site with another 4,435 views in 2017. Ubisoft, if you’re out there, I’m pretty sure you can break even on the investment to bring this one back to life! Bryan Lee O’Malley is at least wholeheartedly on board so that’s one licensing hurdle out of the way. The next most viewed game on the site also shouldn’t come as much of a surprise. Bookworm, including its many sequels and variations, has been a popular word game since it first showed up in 2003. It’s one of those games that breaks out of the typical gamer crowd and pulls in everyone from grandparents to CEOs. Unfortunately, many versions of the game have since been delisted and Electronic Arts isn’t in any rush to bring them back. While searching for ways to play the game in 2017 over 2,000 views came to us with plenty of comments asking for help and lamenting the loss. Looking ahead to 2018 I’m sad to say I expect more games to be delisted or lose online features. More titles than ever are built around multiplayer, be it competitive or cooperative, on a large scale like PlayerUnknown’s Battlegrounds or one-on-one like Street Fighter V. Without capturing a large enough audience the value just isn’t there to keep supporting these games and modes, and publishers are quicker than ever to put their funding elsewhere. Throw in licensing deals that were established in the heyday of the Xbox 360, PlayStation 3, and Wii era and there’s just no denying we’re set up for more losses in 2018. I’ll do my best to catch them before they’re gone and dig deep to find out the when, where, and why. The Delisted community was a huge help with that in 2017. The site received over 30 submissions including a lot of games that I would never have caught so quickly on my own. Keep ‘em coming and I’ll knock them out as soon as I can! I really, truly appreciate the help and responses so far! Thanks again to everyone for a great 2017!